I love, love... love, having my hair washed and my scalp massaged at the hair salon. Do you hear me, sisters? When I first saw the Woof-Ah Bath Mitt (PetZen Products), I was thrilled at the thought of passing this happiness on to our dogs. 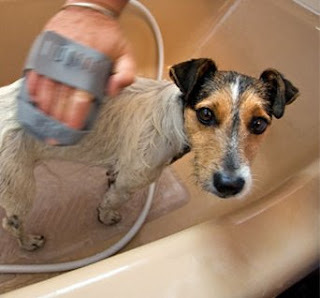 The Woof-Ah mitt is a bath mitt that attaches to your hand while you wash your dog. The water flows into the mitt through a hose and out through several little rubber fingers allowing you to simultaneously massage and rinse the dirt / soap off your dog. We put the bath mitt to the test by washing two big dogs after a trip to beach. 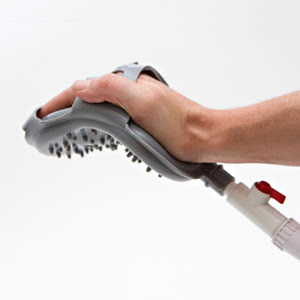 The Woof-Ah mitt easily attached to both the outside hose and to a hand held shower. It did a GREAT job getting all the sand out of their hair. The flexibility of the mitt conformed to the dog curves and allowed us easy access to the hard to reach dog undercarriage. As for the tranquility of the massage, the dogs enjoyed the feeling of the mitt fingers on their back but they didn't seem to appreciate my scented candles. 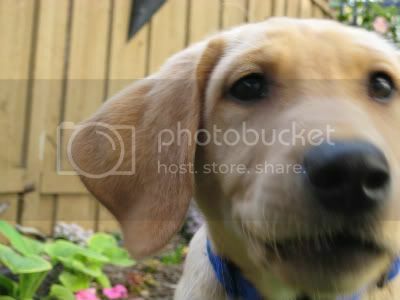 Thanks to Krista and the good people at PetZen, we have a Sweet Dog GIVEAWAY! One lucky winner will receive Woof-Ah Bath Mitt. *Please don't forget to leave your email address so we can notify the lucky winner! Winner will be selected at random. Contest Ends 05/01/09. This contest has ended. Congratulations to Dana. Thanks to all of you who participated in the giveaway. I appreciate your support! Check back for more great product reviews and giveaways.